Please Watch the video if you want to know how to use this program. 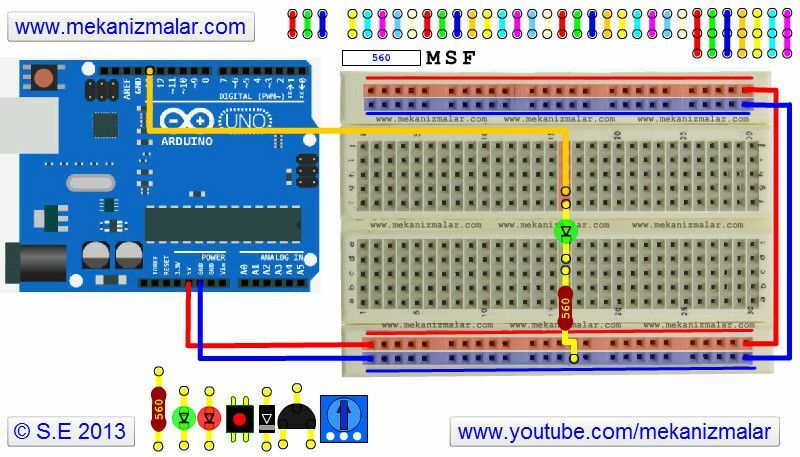 This interactive program allows you to build virtual circuits on a breadboard for an Arduino UNO. It will help instructors build circuits dynamically during class sessions. Students also can build a virtual circuit before implementing the actual circuit itself. Instructors may use a screen copy in their course materials and students may use a screen copy of the virtual circuits they build in their homework assignments. Here is how to use this program! At the top right of the screen you will see wires that can be used in your virtual circuit. By pressing the left mouse button on a colored section of a wire you may drag and position it anywhere on the breadboard. The colored wire acts as a handle for you to drag a wire as a whole. On the other hand the circles at the end of the wires are handles for you to extend the wire to the point you want to. Therefore by putting your mouse on a circle and pushing the left mouse button you can extend the wire to the desired point on the breadboard. When you release the mouse the wire will be stuck on the breadboard at that location. You can do the same thing for the other end of the wire to complete the operation. You may see components such as red and green LEDs and a resistor at the left bottom of the screen. You can drag these components on the breadboard and use them in your virtual circuit design. By double clicking on any component on the breadboard you can rotate it 90 degrees in a clockwise direction. You can rotate a component as many times as you want to bring it to desired position. Due to flexibility of the wires they do no need a rotation property. The LEDs and Resistor have circles on both ends. You can extend these circles to extend the wire connected to it to properly place them on the breadboard. The value of the text can be changed to any value, such as 880 or 10K, to allow changing resistor values. Before dragging any resistor onto breadboard, type a resistor value, such as 10K, into the text area and then drag the resistor to the breadboard. Please do not, I repeat, DO NOT press the enter key when you enter the resistor value. The characters next to the text box, "M S F" correspond to handles for components which are used less, such as motor or servo. When you bring your mouse on the character, an tooltip will appear. This tooltip will show the name and the image of the component. You can drag the character to any position on the breadboard. As soon as you release the mouse, the component will appear on the breadboard. You can clear everything from the breadboard and restart from scratch by pressing the Reset button on the Arduino image. good looking simulator. Friendly use. Is it free for download or payment ?